Packed with non-set decks, the Turian Division is something of a wild card! Duel Decks, Planechase, Premium Deck Series, Magic 2010, Worldwake and Zendikar are all represented here. Having seen Liliana fall, Garruk’s Deck is looking to make a better showing of itself. The inaugural Premium Deck Series release, Slivers, is flexing its sinews to see what its capable of on this crowded field, while as always lurking in the wings awaiting their moment to strike are the Phyrexians. Throw that in amongst regular-set decks, and carnage shall follow! In alphabetical order, here are your Turian Division 2009-10 contenders. And now, to the arena! A bad break for Flyover, mulling down to 5 cards in hand- the turn 3 Mind Rot adds injury to injury. The Blue/White Worldwake deck barely gets out more than a Stormfront Pegasus, while Presence of Mind litters the field with a Coral Merfolk, Snapping Drake, and a Clone (of the Snapping Drake). Flyover tries to land a Surrakar Banisher, but it draws a Cancel. Worse, Presence then reanimates it with Rise from the Grave and turns it against its former master. A Sleep opens the gates, and Presence doesn’t miss the opportunity. Another early scare as Flyover mulls down to 6, bit it manages a decent turnaround with a Silvercoat Lion, Apex Hawks, and an Enclave Elite. A stream of attacks gets Presence of Mind down to 6 life, but Presence has curved out in dramatic fashion. A turn 3 Snapping Drake, turn 5 Djinn of Wishes, a turn 6 Clone (of the Djinn), and a turn 7 Sleep spell doom for the hapless Flyover. Phyrexia gets in position early with a turn 1 Voltaic Key and turn 3 Phyrexian Negator. Unfortuately for Magic’s villains of the hour, the Zendikar deck is disinclined to just roll over, playing a Gomazoa and Living Tsunami. The Phyrexian resources run deep, though, and a Bone Shredder and a Tendrils of Corruption clear the way through. Late chumpies Sage Owl and Merfolk Wayfinder can’t compete with a Phyrexian Processor and Puppet Strings, and the first game’s in the bag. Phyrexia comes out of the draw looking good, but stalls on two land. Discard after discard hits its graveyard, but all it manages is a Phyrexian Arena (after its final Swamp) before being buried by a Windrider Eel, Turntimber Basilisk, Roil Elemental, Frontier Guide, and Living Tsunami. Seem excessive? That’s what happens when you drop down a pair of Ior Ruin Expeditions and then hit a Harrow. Eager to atone for its failing, Phyrexia keeps a mana-heavy hand with a Puppet Strings, Dark Ritual, and Living Death- drawing into a Priest of Gix and Order of Yawgmoth. Rocked back on its heels, Unstable Terrain manages a Windrider Eel and Sage Owl, but comes off the rails when a Phyrexian Colossus touches down. With only two critters in play, and with the Order’s Fear ability, Terrain is delivered a coup-de-grace in one swing. An uncharacteristic lack of creatures costs Garruk, but their quality keeps him in the game: two Blastoderms, a Wild Mongrel (with Elephant Guide), aided by a pair of Serrated Arrows. Drudge Skeletons and a Wall of Bone manage to keep the attackers at bay for a time until the Arrows hit, but just as things look grim for Minions both the Nightmare and Cemetery Reaper make their appearance. Able to outlast the Blastoderms, whose fading put them on a short timer, death comes on fiery hooves to clinch the opener. Garruk established early pressure for the second match that never let up. A sign of Death’s Minion’s desperation: using Diabolic Tutor to fetch a Wall of Bone just to buy time. A Blastoderm and a Wild Mongrel (enchanted this time with Rancor) get in some early beats, and a Drudge Skeletons is knocked aside once again with Serrated Arrows. The Mongrel gets hit with a Doom Blade to fizzle an attempted Elephant Guide, but a Plated Slagwurm with Rancor is unstoppable. It’s going to a third! The hand is still unkind to Garruk, who mulls down to 6. A Wild Mongrel slips the leash early, follwed by a Basking Rootwalla and a Wirewood Savage. Death’s Minions hit their stalling stride with a Wall of Bone followed by a Looming Shade and a Bog Wraith. Garruk lands his trusty Serrated Arrows once again, and the Shade is quickly dispatched. A timely Mind Rot rips a Ravenous Baloth and Windstorm out of Garruk’s hand, and Minions begins to claw back with a Zombie Goliath and Cemetery Reaper. Down to 6 life, Garruk finds the will to struggle with a Genju of the Cedars, Treetop Village, a Vine Trellis, and a Lignify (on the hapless Reaper). 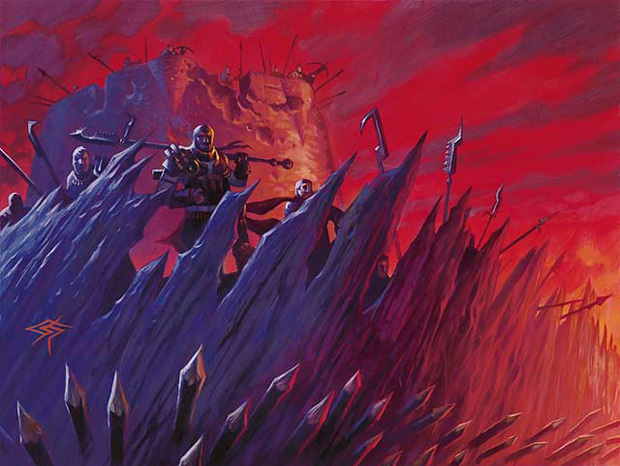 The red zone is congested and seems to be going Garruk’s way when Garruk himself shows up to oversee the end. Although he doesn’t know it, it’s a race between building up to his Overrun ability and Death’s Minions getting two more Swamps. The turn before the Overrun, Minions gets its land and has exactly enough for a 6-point Consume Spirit. Another fight to the finish, and an astonishing upset! Plenty of land drops, so little mana- the Slivers have an abundance of mana, but not the colours it needs. Thus it’s early contribution is a solitary Winged Sliver, gliding alone against a tide of of Myr (Copper, Lodestone, and Iron) led by a Master of Etherium. The hive is overwhelmed before it can even get established. Another spot of bad luck for the Slivers, this time making do with a Metallic Sliver while Dreams pours out an Arcbound Slith and Master of Etherium. Myr Enforcer, Qumulox, and Lodestone Myr follow quickly after, and while The Slivers manages a Virulent Sliver and Brood Sliver, they’re too far behind. This one was never a contest. And then there were four! 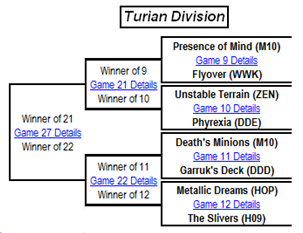 Alas for Garruk’s Deck, Flyover, The Slivers, and Unstable Terrain, they died an inglorious death on the opening round. Still, that leaves four decks that did advance today, and when next you join us they’ll be battling it out until only one remains. Who will it be? Find out then! Slivers. So much potential yet such a terrible land base. I really enjoyed meshing two of them together. Going to be fun to see if Phyrexia can push through. Think it will still. Still, I didn’t think I’d like playing it as much as I do. One of the better of the 6 duel deck decks I’ve played with. I do not see Unstable Terrain in the “Teams to Beat” section.. Fixed. Thanks for the catch!! Sad to see Flyover mulliganing itself out of contention.